The owners Sara Moody, an architect, lives here with husband Ben, a lobbyist in health tech, and their children, Stanley, three, and Nancy, six months. 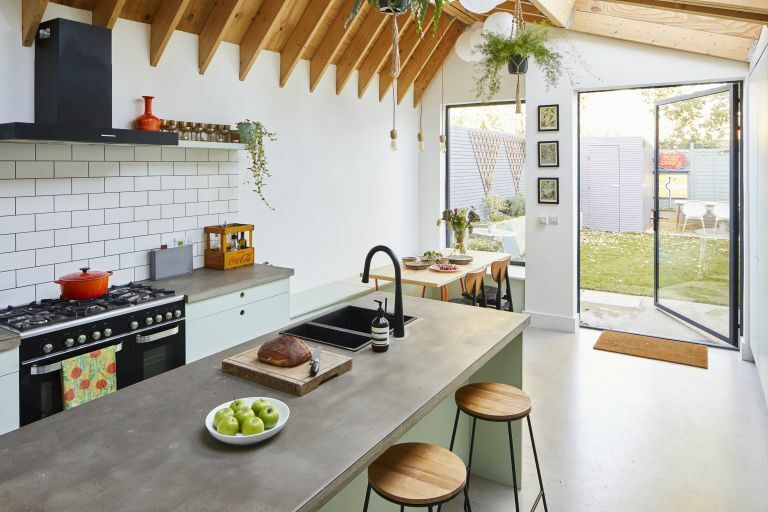 The property A four-bedroom mid-terraced Victorian house in Walthamstow, east London. Every so often here at Real Homes HQ, we come across a project that makes us stop in our tracks. Sara and Ben’s Victorian terrace does just that with its fresh take on a typical family home. As an architect, Sara’s spent some time developing dream homes for other young families. The result is a toolbox of tips and tricks that she’s used to mastermind her own space. 'I work with a lot of young families on their houses, and the beauty is that you get used to working with this type of property. We wanted to strip everything and bring back the original character. 'We wanted the original part of the house to feel traditional, but I thought we should make it clear that the kitchen extension and the loft were new and different. 'We wanted to get the biggest rooflights we could, and Velux was the most affordable option. To fit them in and bring as much light as possible into the existing part of the house, the roof structure had to be bigger on one side. 'It divides the space well – the steeper angle is where the kitchen-diner area is. It also meant we could maximise height as much as possible. If we’d had a flat roof, we would have been restricted to three metres. 'We often have the doors between this room and the living room open to create one space. At night, we can shut them to be cosy in the front room. In a way, this room is a kind of transition into the family space. We fancied ourselves being sophisticated with the piano and the books, but in reality, it’s turned into more of a playroom – a sort of overspill from the kitchen. 'It might have been sensible to go for white for our darker front room, but we wanted to have a more traditional sitting room. Darker colours were used more in Victorian design, so we opted for rich hues. I don’t think it makes the room feel any smaller. 'Ben and I love mid-century furniture and our bedroom reflects that. We moved the position of the doors in both bedrooms to accommodate built-in wardrobes. We bought the headboard from Ebay and used that as our starting point for the scheme. 'This bedroom was intended to be the master bedroom, but while the kids are little, we want to be on the same floor as them. We designed the space before we knew what it was like to have two kids! 'Ben picked the tiles for the loft en suite. He’s a good Yorkshireman and a “wheeler dealer”, so he went off to find something we could afford based on what I said I liked. We loved the peppermint colour, and to make it feel less like a separate bathroom, we added peppermint touches in the bedroom, too.